Four Indicator Styles – Enables operator to visibly see the improvement of the oil cleanliness, propeller style shows flow of the liquid and directional slows operator what direction the flow is. The drip tube will show the speed of the water being removed from the dehydrated oil. The rate of which the water is being removed can resemble a slow drip (not high concentration of water in the oil) or a steady stream (indicating a large concentration of water being removed from the oil). 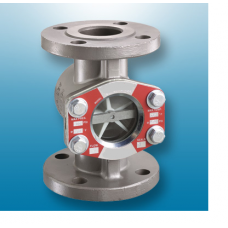 Designed for applications with maximum operating pressure of 200 psig (13.8 bar) and/or temperature of 225ºF (107ºC). 3-Year “No-Leak” Guarantee: A specially designed seal creates continuous force between the body and outside diameter of the glass lens for a better seal than standard flat seals. Bolt-on-body design requires no maintenance or torqueing sequence in order to prevent leaks. Maintenance is safer than units using tie rods to fasten the lens and seal to the body. Feature dimensions that match Jacoby-Tarbox and Penberthy and other manufacturers' units. Available in 3/4", 2", 3" and 4" sizes. Rated for vacuum service up to 635 mm (25”) at 85.5% vacuum, which equates to 12.3-psi (0.84 bar) vacuum.